It's not about too any chocolates; it's about having a large enough mouth, hat, and bra. Unfortunately, I only had one of the three. Care to guess which one? Lorna wants to be the best student, mother, wife, worker, daughter, friend, pet owner, woman she can be. Can she manage to have it all without having it all fall apart? We decided to put Alex in daycare, knowing he would survive/ thrive benefit from the exposure to someone other than his inept-but-determined mother others. After calling about 15 certified daycare providers and hanging up after hearing the ear-drum-bursting din in the background, I began doubting Alex’s our decision to opt for daycare over me. Chuck knew a woman from his church who watched children “on the side” (code for “not certified”). Since she was Methodist and grandmotherly, she was as certified as we needed. “M” was, quite literally, a Godsend. I marveled at her ability to take in six children of varying ages, care for all of them, do things she needed to do (like sewing), and appear sane at the end of the day. I believe she was an alien, but she was wonderful and worth the $100 per week we paid her, even though Alex wasn’t there all day, every day. “M” potty-trained Alex and told us the exact night he would take his first steps. Alien, I tell you. Can you tell who's alien and who's not just from looking at them? Neither can I. See my point. They walk among us and teach our young to pee and poop in the potty. With “M” taking such great care of Alex, I could focus on my studies and work. Returning to campus, I discovered that I wasn’t alone when it came to major changes. They hired a big-name sociologist as their new department chair. Tides had turned; the air was thick with arrogance. During my first year, every faculty member loved me, the brainy researcher who’d already been published; I was their “Golden Girl” (without the Florida Condo, sexual innuendo, and plastic purses). This year, under Dr. C’s reign as Supreme Master of All That Was True, my life/value as a human being skill-set was useless. Take a good look at these "birth control" glasses. 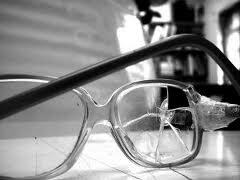 Was Dr. C the one wearing them or was he the one who knocked them off some innocent, near-sighted kid? The faculty knew what he did to me and so did my student colleagues. Everyone kept quiet. We had a cozy abusive family dynamic happening in the halls of higher learning. Dr. T, the professor from whom I TA-ed was angry and wanted to fight for me, but he was up for tenure. I begged him not to risk his career for me, assuring him I would be fine. I would’ve been more convincing had I not been sobbing at the time. I landed a part-time job as a researcher for a large nursing home doing quality assurance studies. It helped to pay the daycare bills and I still had my full scholarship. Dr. C hadn’t pulled that from me as my reward for my silent “Good Girl” schtick. My acting prowess, it seemed, came in handy in all kinds of situations. Mommy missed Alex’s first Halloween (he probably did, too, being only 5 months old). I was in Dr. C’s class and bought him a Superman costume. His dad flew him around to the few homes we trusted, just to show off our super-man. I vowed to make all of his costumes for the rest of his life. That was my problem. 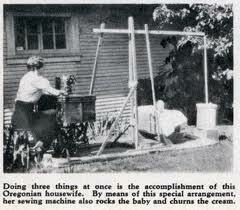 I needed to live in Oregon and have a machine that could sew, rock the baby and churn butter. They didn't have those in D.C.--not even in the Smithsonian. Despite my best efforts in Dr. C’s class, he gave me a “B”–the only one in the sea of A’s that populated my grad school transcript. I sacrificed precious time with my little boy only to be punked by this little man. I bet he was the scrawny kid that was mercilessly bullied and he was just getting back at anyone he perceived as weak. Was it because I didn’t drink or smoke pot during the last day of class, which he held at his apartment, or because I refused to pose as a homeless person on the streets of DC to help him with his newest research project? Dr. C mistook integrity for weakness and would regret it…later. What other lessons does Lorna have in store for her as she tries to do it all? I am reading back, I missed a few days. This guy… sigh…. I’ve dealt with them too… just want to high five them…… in the face…… with a chair. I’ve had my fair share of lessons in this life–that’s for sure! 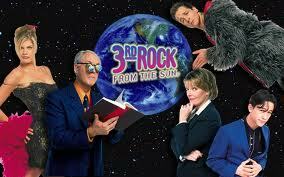 Dr. C was a great lesson in dealing with dysfunctional people that exist in the world. I couldn’t agree with your more! Thanks for stopping in, reading and commenting! Hope to see you again! Hard to believe such awful people exist. What an unhappy man he must have been. yuck. dr. c is someone who probably went through life with a lot of unresolved problems. and yes, he’s taking it out on you bc in his mind, you can ‘afford’ to have a worse grade bc you supposedly don’t have it as bad. people should stop pretending they are karma. This, the reference to “the circus.” I felt like I was eating fire, getting knives thrown at me, and tending to the animals! The only books on his shelves in his office were multiple copies of the two he had published. This man was arrogance personified. He would only read a blog about how great he was. That wouldn’t be my blog! WOW … what an “A – hole” … !!!! … mmm … sorry for being bold. He is so disgusting. Why do people feel they can overpower someone???? …. and …… still think that Karma is not going to bite them in the a–. I believe his future had some downfalls from this. UGH … I don’t even want to think about it anymore. Please continue … I will pull myself together by the next one. wow — I would hate that too. Don’t like being between a rock and a hard space (as I am right now at work). But sometimes you just can’t fight these things at the time. Hope he recognizes himself in your blog (as if he would read anything that wasn’t his). 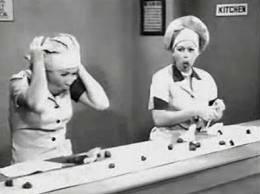 I actually saw that episode, er, clip of ‘I Love Lucy’! And what a jerk! At least you had people willing to fight for you and at least people knew about it. Although knowing about stuff like this and not doing anything at all might be worse. I understand about the one up for tenure and fellow students aren’t likely to be able to do much, but still. That machine is awesome, lol. I imagine Alex was super cute in that superman costume, lol. Put babies in any costume and cuteness will abound! People like Dr. C make my blood boil! There seems to be so many of them in the world. I think it was Dr. C who wore those “birth control glasses” and now forevermore has to prove his manhood–not having the awareness that he still can’t! Good lord – thank goodness you managed to get past this awful gatekeeper.